Find privacy and peace in A Cottage in the Woods, a 2-bedroom, 1-bathroom home with an open floor plan to keep everyone connected and relaxing amenities the whole family will enjoy! Soak your troubles away in the outdoor hot tub, watch the game of the year on the big screen TV, make your family’s favorite casserole in the fully equipped kitchen, and clear the coffee table for a night of board game fun! 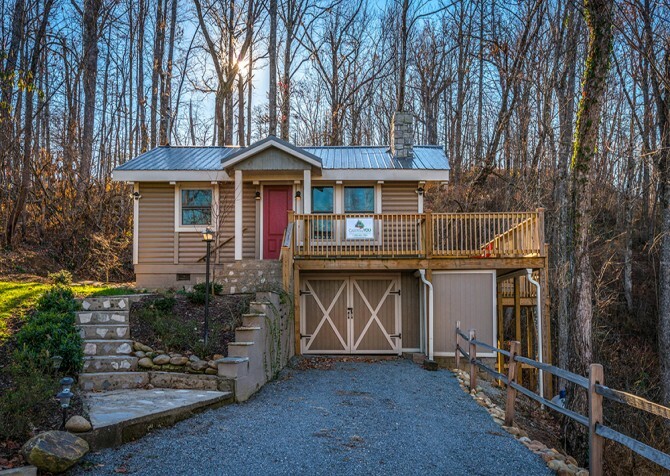 With wooded views all around, precious memories are sure to be made in this charming Smoky Mountain cottage. Beautifully designed, the stylish cabin is a modern mountain escape that’s equal parts cozy and chic. It even boasts an amenity you don’t find at most mountain cabins: a grassy yard where you can stretch your legs and let the kids play. Enjoy cozy nights inside, the comforts of home, and easy access to the fun of downtown Gatlinburg and the Great Smoky Mountains National Park! Stepping into the living room just off the front door, hang your coat on a wall hook, stretch out on the sofa, and let your vacation begin! With neutral vibes, a pop of red, and a large gas fireplace surrounded by beautiful stonework, this living space provides a calming atmosphere sure to satisfy. Gather your friends round the large coffee table and grab a board game from the shelf nearby for an evening of playful banter and uncontrollable laughter! After your Gatlinburg exploration, unwind on the love seat with comfy throw pillows or rest back in the sitting chair and switch on the floor lamp for a good read. If the kids are still feeling a bit rambunctious from the day’s excitement, easily roll the coffee table back so they can play wrestle on the large area rug. After the pajamas are on and the popcorn is popped, pile on the couch for movie night — don’t forget to close the curtains to create a theater-like experience! Head over to the open kitchen and dining area, beautifully lit with natural light from the sliding glass door to the back deck and large window over the double sink — each displaying lovely wooded views. Fully equipped, this kitchen is more than ready for your mom’s homemade macaroni and cheese, dad’s famous lemon pepper chicken, grandma’s traditional vegetable soup, and grandpa’s secret pound cake recipe. Choosing a bedroom in this home away from home will be as easy as pie, because both bedrooms are pretty much equally matched. Each boasts a queen-size bed for cozy nights, a flatscreen TV for late-night TV dramas, a ceiling fan to keep things cool, a wall mirror for last-minute hair checks, multiple lamps for reading comfortably, and 2 curtained windows with wooded views. A few steps down the hall, you’ll find a convenient bathroom with a shower and tub combo, great for hot bubble baths! Boasting a flat driveway with parking for 2, A Cottage in the Woods makes it easy to unload suitcases and pack in souvenirs. Ascend the 10+ stairs to the bold red door, eagerly awaiting your first step inside. As you walk through and explore the cabin, you’ll be drawn to the incredible views just beyond the sliding glass door. Step outside to get a closer look at the picturesque trees and be sure to keep an eye out for local wildlife! Head to the edge of the deck for a relaxing surprise: an outdoor hot tub, where you can blissfully spend every morning, evening, noon, and night! Breathe in the mountain-fresh air as you sit back in one of the deck chairs and rest your herbal tea on the side table. To really get the party started, fire up the charcoal grill and host a barbecue shindig. Pro tip: leave the sliding glass door open to increase the party space and fill the cabin with the heavenly aroma of a freshly grilled meal. To top off the cabin amenities, complimentary Wi-Fi is provided for all your internet needs. In fact, this home boasts high-speed internet to easily keep you up to date on your favorite Hulu originals, effortlessly keep up with emails, and skillfully outwit your bestie with secret Google searches. Venture out of your secluded cottage into the bustling town of Gatlinburg for good food, great attractions, and even better memories! For a day of fun on the mountain, head to Ober Gatlinburg — where ice skating is year-round, and excitement is, too! Take the youngsters to Kiddie Land to play, get the whole family on the carousel for a cute family video, tackle the ski slopes with your hubby, and race through the trees on the Ski Mountain Coaster. As the most visited distillery in the U.S., the Ole Smoky Moonshine Distillery (aka “The Holler”) is a must-see to add to your trip itinerary. Enjoy carefully brewed samples of mountain moonshine in an old-timey atmosphere — what a great way to spend the day!